After four weeks of Advent, preparing to greet the joyful season of Christmas, we now turn our attention to welcoming the birth of Jesus, Son of God and Son of Mary. Apart from Jesus himself of course, the two central figures of the Christmas story are Mary and Joseph. Many other people have a part in the story – there is Mary’s cousin Elizabeth, her husband Zachariah and their newborn son, John. There are the shepherds and the Wise Men who come to Bethlehem to see Mary’s baby. There is King Herod and the inn-keeper in Bethlehem, who could find no room for the young couple in need. And of course, there are the angels who appear to the shepherds, to Joseph, and most significantly to Mary. The story of the birth of Jesus is first told in the Gospels. It has been retold in story and in song for more than two thousand years. And it has been depicted for us in beautiful, masterful works of art. It is interesting to note that several icons of the 16th century depict Joseph as brooding, puzzled and perplexed, as he struggles to come to terms with a situation which initially makes no sense to him. The many representations of the Annunciation on the other hand, often show Mary kneeling in prayer before the angel, who brings the news of the conception and birth of Jesus to her. Mary is rightly presented as a woman of extraordinary faith and total openness to God’s will for her. And yet the puzzlement and confusion of Joseph were present in Mary too, as the Gospel account of the Annunciation makes clear. When the angel appeared to Mary, we are told that she was at first greatly disturbed and then confused. How, she asked, could what the angel was telling her, possibly come true? Equally, the deep faith and openness to God which marked Mary’s response to the angel, were also present in Joseph. He is presented in the Gospel stories as a man of courage and compassion, ready to respond to God’s call, even if he doesn’t fully understand it. This call to faith in the midst of confusion, to courage in the midst of uncertainty and fear, and to trust in God in the midst of adversity and difficulty, is one which we all face in the circumstances of our own lives. God’s ways and God’s call are not always easy, comfortable or welcome. And yet Joseph, once he understood what God was asking of him, responded with determination and courage. Mary too, once she realised that the Lord would support her in all that he was asking of her, gave her unconditional “yes”. Mary and Joseph therefore become for us, models of what faith looks like in daily life. In the end, the depth of our faith is revealed by the measure of our trust in God’s fidelity to his promises: to be with us always, to lead us along the paths of life, and to draw us into the mystery of his saving presence in our world. Because Mary and Joseph were people of such deep and trusting faith, “the Word became flesh and lived among us”. May we too allow the Lord this Christmas to develop in us a deeper and more trusting faith, so that through us, he might come into the lives of all those we meet. 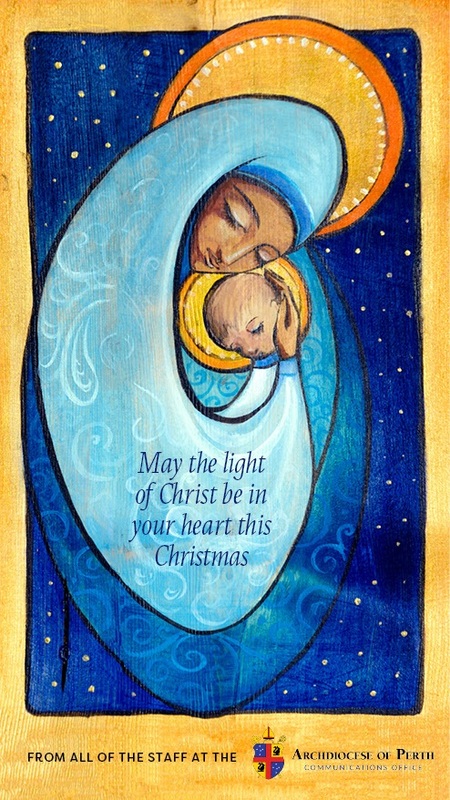 I wish you and all those you love and care for, a very happy and holy Christmas.